Important: Western ROAMs access is required for Remote Access to your office computer. Instructions can be found below and in Remote Access to your Office Computer. Western ROAMs (Remote Office Access Management System) is provided by WTS for secure remote access to network drives and to your office computer. This is a Virtual Private Network (VPN). You will not be able to use the Remote Desktop Connection or map network drives from off-campus without it. WTS has their own help provided from remote.uwo.ca. Access to Western ROAMs has been granted to many faculty and staff already. If you are not sure if you have access, contact SSTS using the Help information at the left side of this screen, or you can try to Login to remote.uwo.ca. If you do not have access, complete the Corporate Access form available from the ROAMs page. Complete Section I and II at the top. In Section III, Under WTS-Central Server Access circle Y for ROAMS. See the bottom of page 2 of the form for information on where to send the form. Go to Western ROAMs at remote.uwo.ca and follow the link to Pulse Secure Downloads. Pulse Secure version 5.1 or above is the recommended method for ROAMs access. Download the correct version for your operating system. If you don't know whether you are running Windows 32-bit or 64-bit, open File Explorer, right-click on Computer in the left column and choose Properties. From the Downloads page, follow the instructions in the Pulse Secure Manual Setup PDF. Pulse Secure will load automatically when your computer starts up. Find the Pulse secure icon in your System Tray and click Connect next to WesternU. Launch Junos Pulse from your Applications Menu. Click the Connect button beside WesternU. You will be prompted to select a Realm. Choose UWO. Enter your Western Username and password and click Connect. Once ROAMs is running, you can use Remote Access to your Office computer as you would normally. Remember to disconnect from Pulse Secure when you have disconnected or logged out of your Remote Desktop session. Once ROAMs is running, you can connect to UWO network drives directly from your local computer. Select a drive letter from the Drive drop down list. Make sure that Reconnect at logon is NOT checked. Check Connect using different credentials. Click Finish. When you are finished you should disconnect the network drives. Right-click on the drive letter you mapped above and choose Disconnect. Enter your network password when prompted. A new icon representing your mapped network drive should appear on the desktop. You will see your H: drive with your username as a subfolder. Open a Finder window. 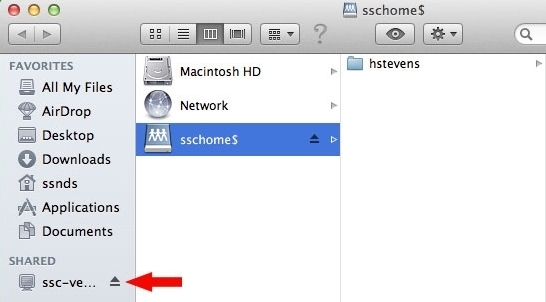 In the left margin under Shared, click on the eject button beside the ssc-venus share name (see the arrow above). You should first Log off or Disconnect from your Remote Access session. If you mapped any drives as described in #5, please follow the instructions above to disconnect your mapped drives. Find the Pulse secure icon in your System Tray and click Disconnect next to WesternU. Simply click Disconnect from the Junos Pulse Connections window. If you need assistance with Western ROAMs, please try the Help section on the remote.uwo.ca web site. If you still need assistance, please contact the WTS Help Desk at extension 83800 (or 519-661-3800) or send an e-mail to helpdesk@uwo.ca. If you need assistance using Remote Access to your office computers or mapping drives, please call the SSTS main office at 519-661-2152 or extension 82152 or email ssts-help@uwo.ca. Note: You may need to adjust some of your firewall settings in order to map drives to UWO servers while using Western ROAMs.